Who wouldn't want to learn from a charming and gentle teacher? This indispensable book for teens also resonates with parents, grandparents, and any adult who influences young people. While this book is based on grieving, like Tear Soup, especially the loss of a beloved pet, it is much more about living and growing. Kids spend a lot of time wondering about how to be a good friend, how to communicate effectively, what their purpose is, and what it means to be successful in life. Truth is, even a lot of adults wonder about these things. What if you could learn all this from man's best friend? Well, you can. If you want to become a better person, why not travel WATSON'S WAY. 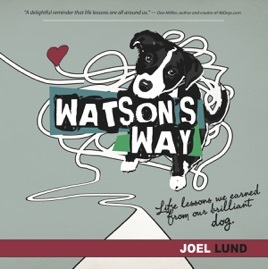 An award-winning inspirational book in the tradition of Marley & Me, Joel Lund shares lessons his family earned from their beloved dog, Watson, on issues that matter to teens, like How to get along with others, What patience looks like in practical terms, How to stand up for what you believe in, When to try new things...even if you're nervous, Why laughter is good for building better relationships, Why being shy is OK, Why bathing is an important spiritual exercise, How to show care for others, and more. This heart-warming book is stuffed with great pictures of the handsome, tuxedo-colored black & white Watson, along with great quotations, and humor. Each chapter includes questions to consider and a place to journal. If you liked Don't Sweat the Small Stuff for Teens, you'll love Watson's Way. It will become a welcome guide for traveling through life with style, grace and fun.